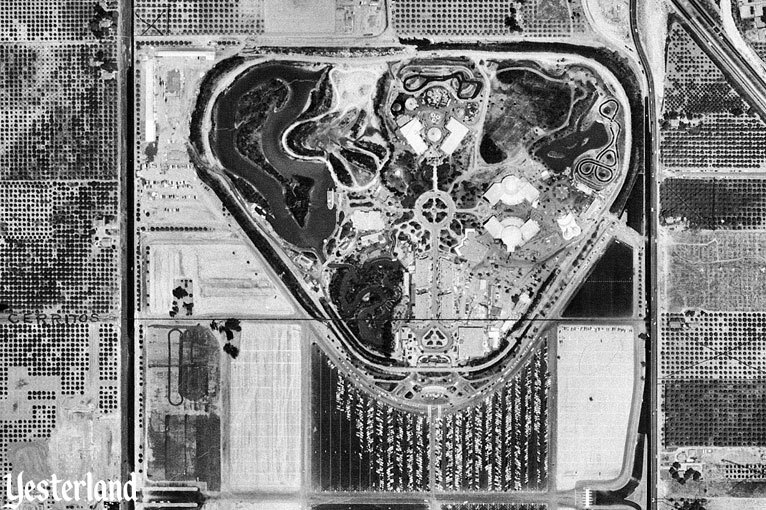 Pay your 25-cent parking fee and drive into the park’s 100-acre parking lot. It’s bigger than the park itself. Friendly parking attendants will direct you to a spot. Arrive early, and you may find yourself parked in the convenient Bambi section. 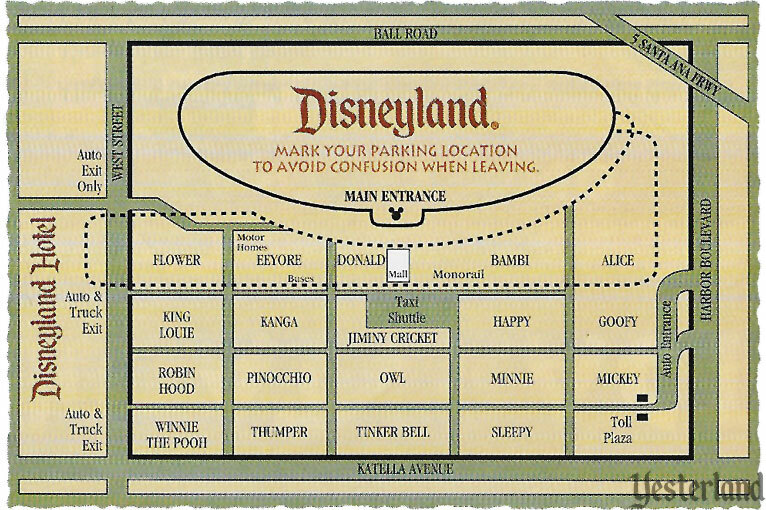 But if you arrive later on a busy day, you could be way back in Thumper or Winnie the Pooh. Regardless of where you park, you can walk directly to the front gate. 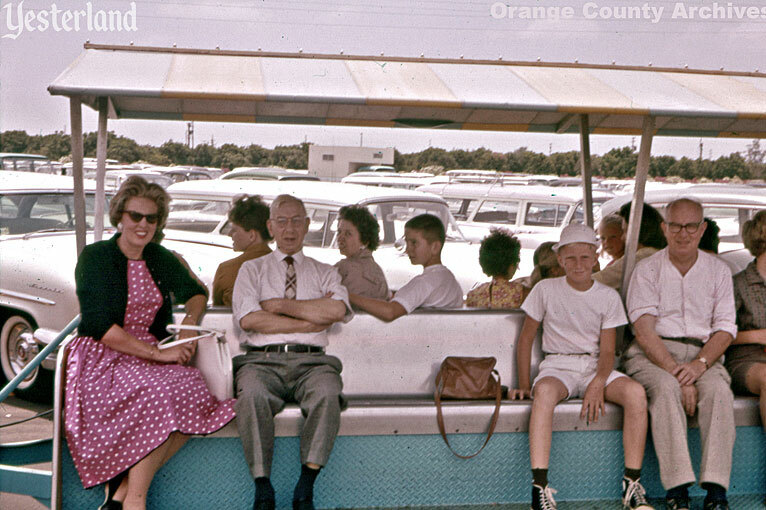 However, you may prefer to take a free tram to save your feet for the park itself. 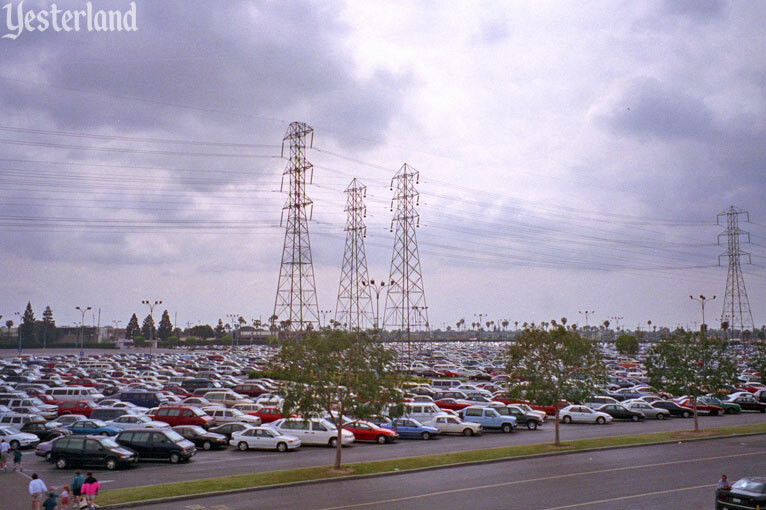 As you cross the lot, you’ll see huge towers for high-tension electric power lines. At the end of the day, it’s time to walk or take a tram back to your car. You do remember where you parked, don’t you? Don’t you? 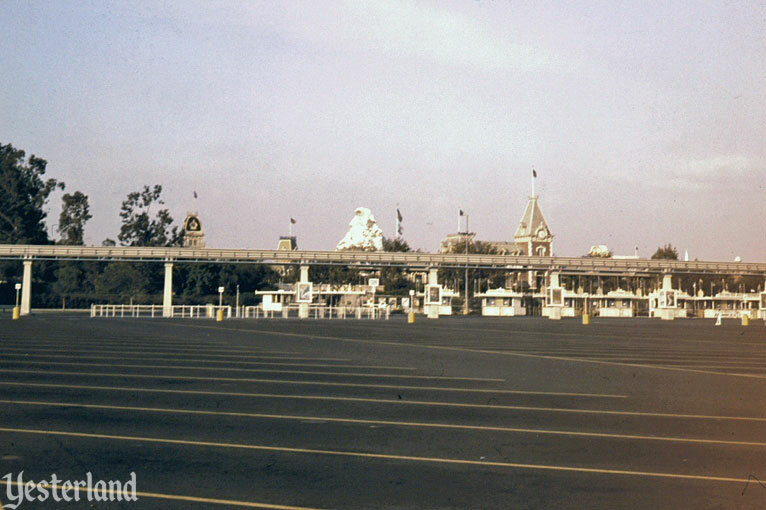 There was a huge parking lot directly in front of Disneyland’s main entrance when the park opened in 1955. Using the U.S. Government’s Consumer Price Index (CPI) inflation calculator, 25 cents in 1955 is equivalent to $2.25 in 2016. 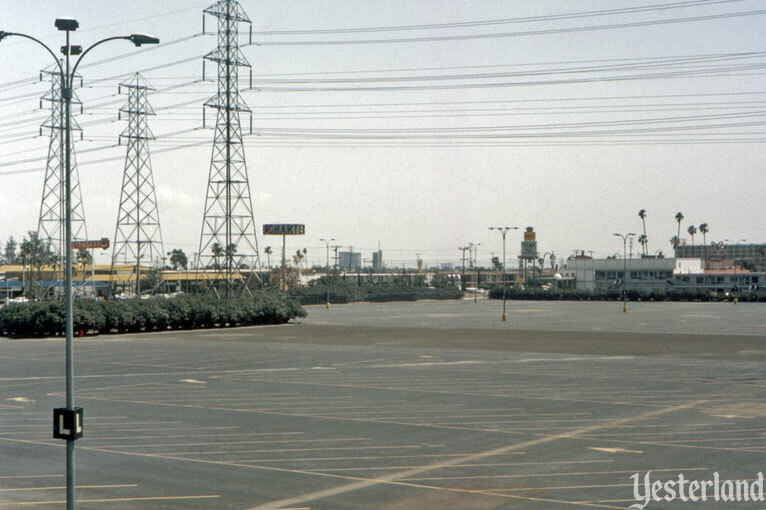 The lot grew to 15,167 spaces. The price of parking crept from 25 cents to 50 cents in the 1970s and $2.00 in the 1980s, with larger and more frequent increases beginning in the mid-1980s. 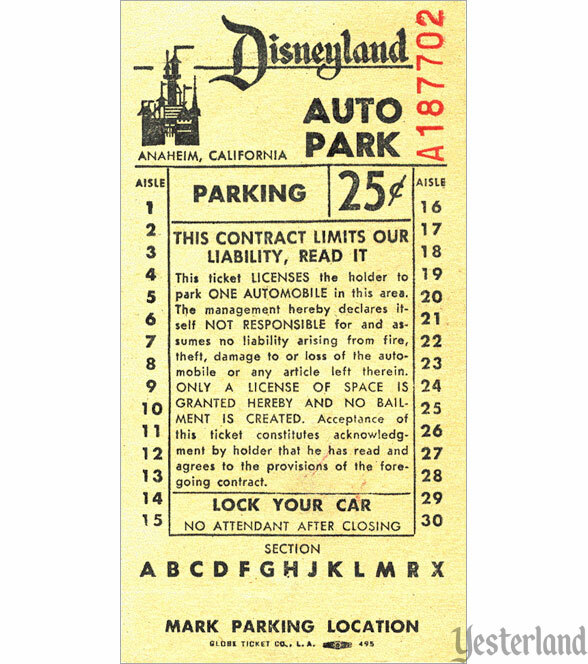 Parking sections received character names, where once they had only been identified by letters. The show building for the Indiana Jones Adventure took a bite out of the Eeyore section. But, overall, not much changed. Yesterday it was a parking lot. Today it’s Hollywood, Yosemite, San Francisco and Paradise Beach. 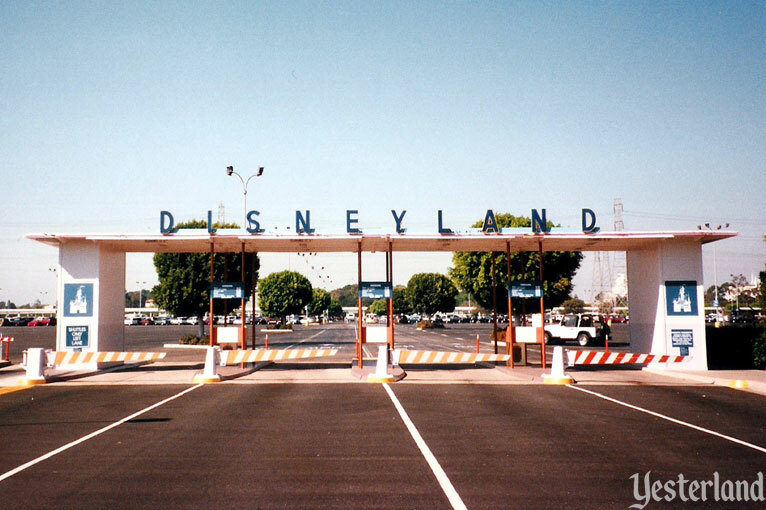 Disney’s California Adventure began construction Thursday, as people bid adieu to the familiar Disneyland parking lot that has served as entrance to the park for 42 years. “We’re standing in Hollywood right now,” said construction manager Alan Rose, pointing to pavement that still looked remarkably like the parking lot it was two days ago. But there were already signs of things to come. A discarded Bambi sign lay on the ground, torn from its pole. The high-tension power lines were rerouted along the edge of the property. The new towers did not have the large footprints of the old towers, but were still (and continue to be) eyesores. Now guests park in the massive Mickey & Friends parking structure, the Simba and Pinocchio lots over by the Disneyland Hotel, the Toy Story Lot across Harbor Blvd. from the Anaheim Convention Center hotels, or wherever Disneyland directional signs and cast members direct them to park. 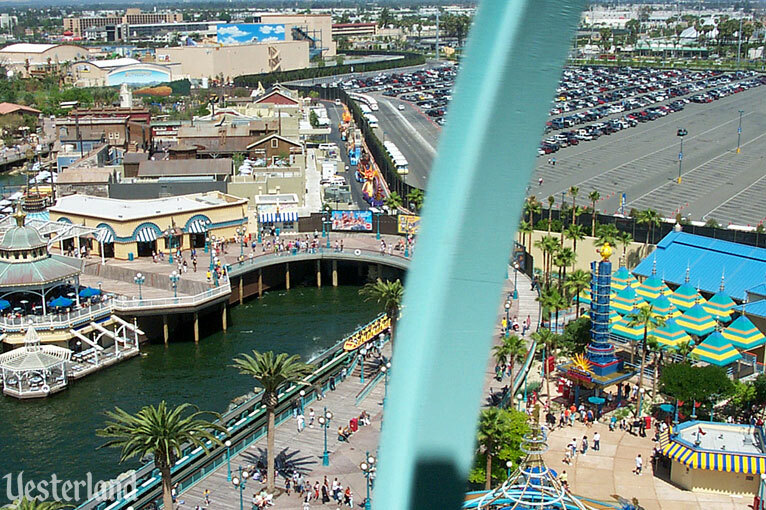 The cost of parking is no longer “nominal.” In 2016, all-day theme park parking is $18.00 for cars and motorcycles, and more for larger vehicles. 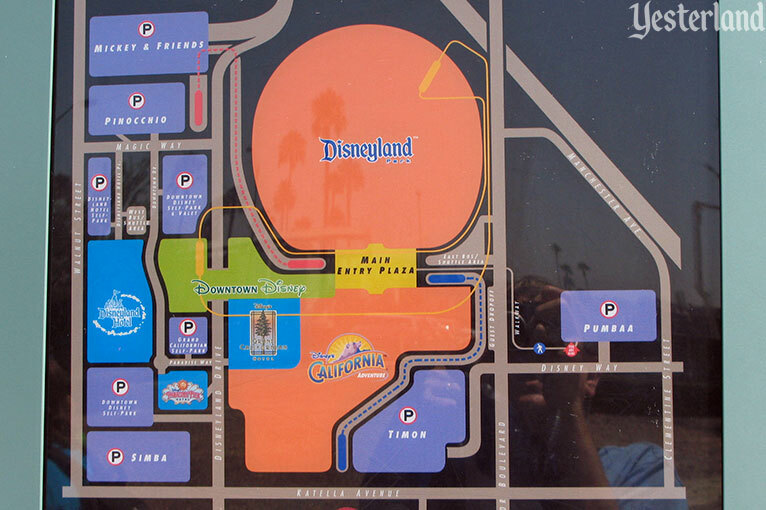 High-capacity ramps to and from the Santa Ana Freeway provide improved access to the Disneyland Resort from Los Angeles, but access to the Mickey & Friends structure can be awkward from the south. 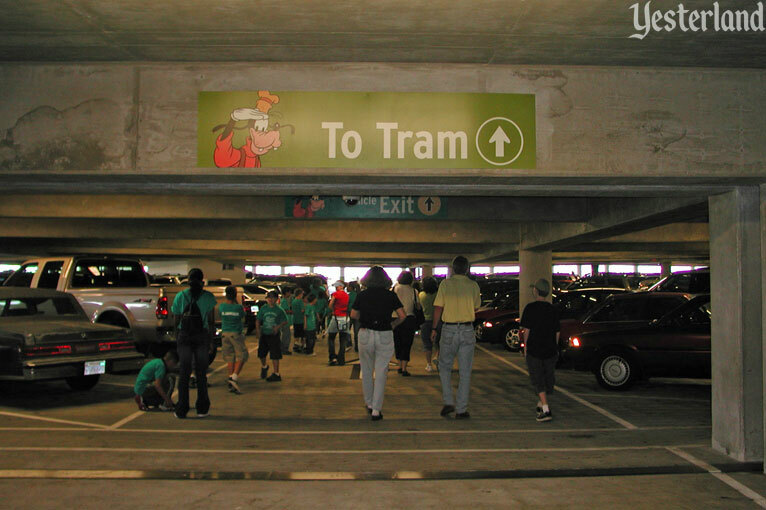 There’s nothing fun or “magical”—or even particularly efficient—about the Mickey & Friends parking structure. The structure is stark and modern. Aside from Disney characters on signs, it’s not “Disney” in any way. 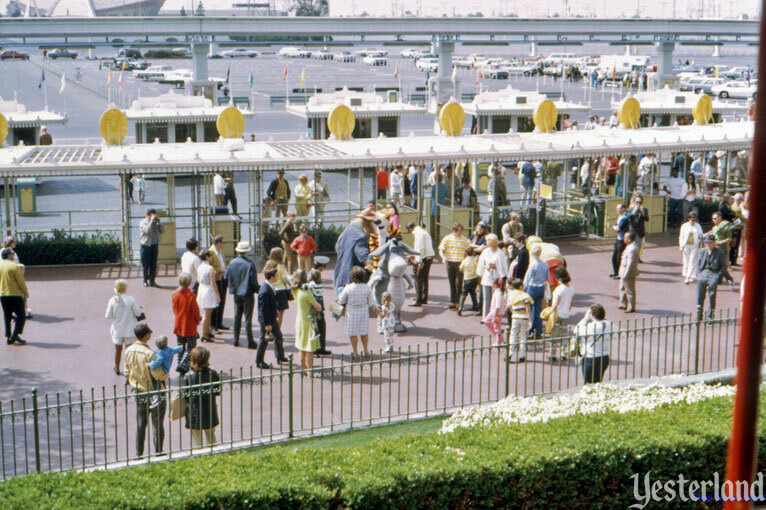 Because the tram stop is outside the structure, beyond a far corner of it, many guests end up walking a substantial distance—and then they still have to wait for a tram. 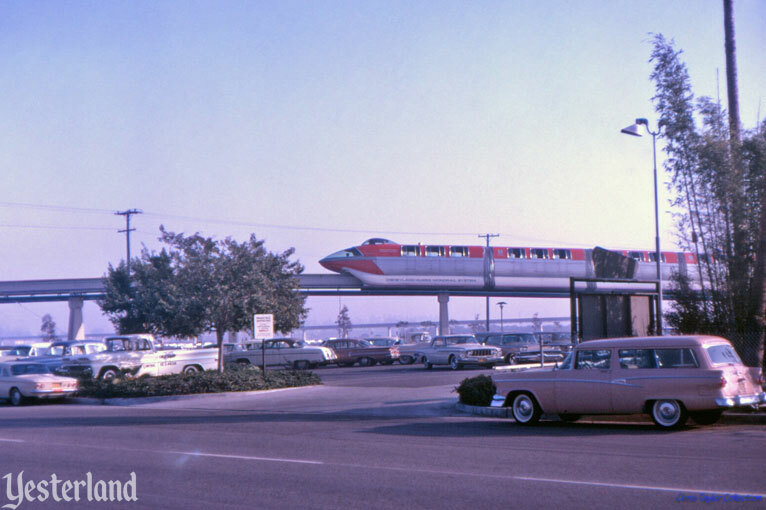 Pets en route to the Disneyland Kennel Club ride the parking lot tram—the only Disneyland ride that allows pets. 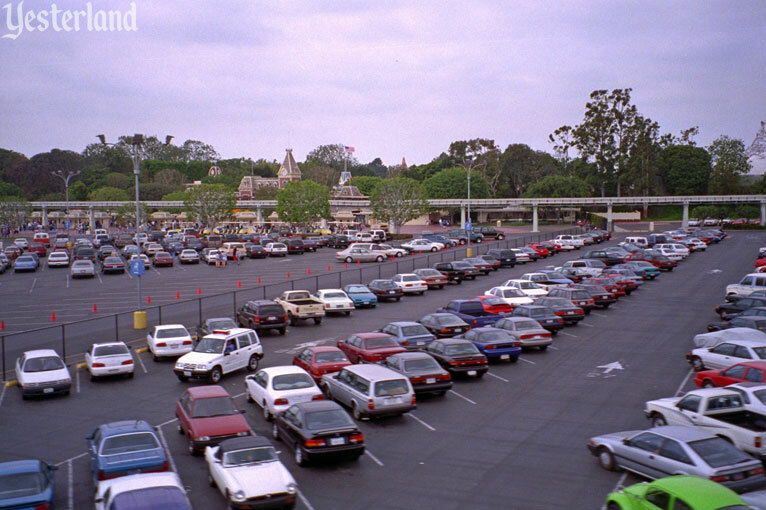 For a number of years after Disney’s California Adventure opened in 2001, some guests parked in the Timon lot, which occupied roughly 20% of the old Disneyland parking lot (where the Mickey and Sleepy sections once were) but that lot disappeared as the newer park expanded. The 1,300-space Pumbaa parking lot across Harbor Blvd. 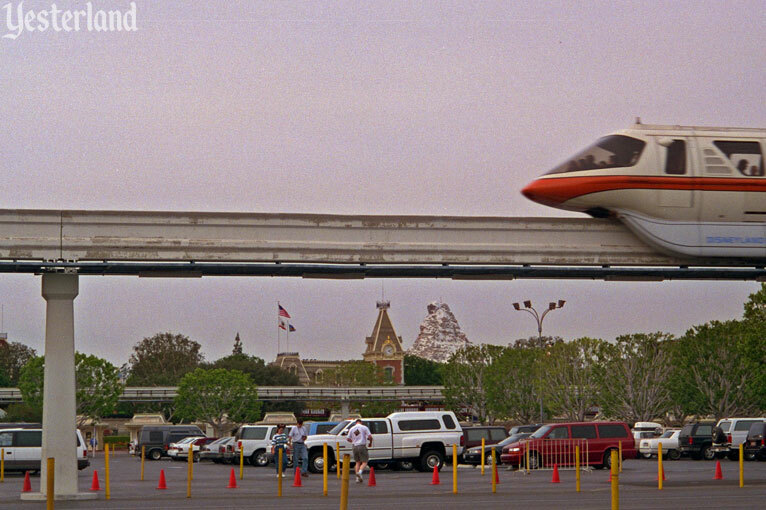 (where Disney imploded the 10-story Grand Hotel in 1998) will become a 6,800-space parking structure. 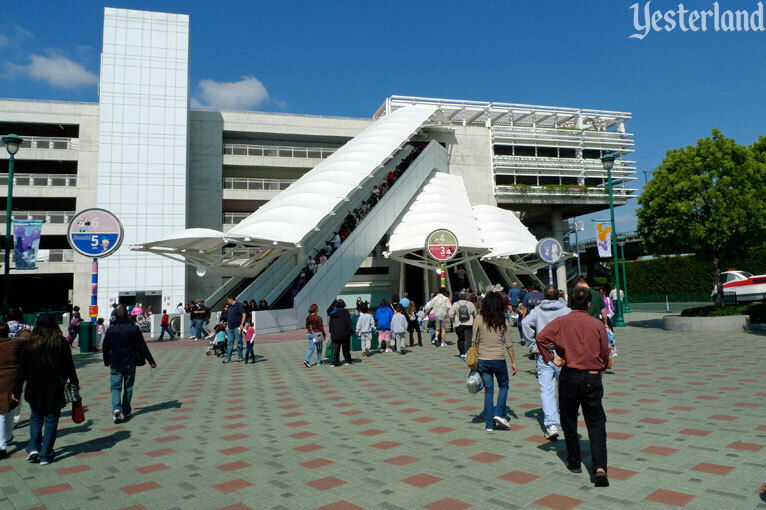 A pedestrian overpass will connect this new parking option, along with a transportation hub to its north, to the rest of the Disneyland Resort.